We continue to review Wine of Moldova and we’re still on the white wine theme, but this time it’s time for some riesling wine. Single variety riesling wine is growing in popularity here in Moldova, but it is a bit tricky to find some top quality riesling thou, as there is not yet a definite style of this wine highlighted by the local winemakers, that’s why every winemaker is trying to perform as best as he knows, in his own way. The wine that we are going to review tonight is Exceptional Riesling 2014 from Asconi. The wine has a bright, transparent and pure yellow color, with the rim-color of a brilliant green shade. The nose is rich with no signs of wine faults. The first nose is quite insistent and it brings notes of sweet fruits and a strong scent of petroleum: yellow apple, quince, pineapple, mango, straw, honey and a hint of white cherry jam. The nuanced notes of petroleum and rubber are the two aromas that may be found almost in every Grand Cru d’Alsace riesling wine. The wine is medium-sweet, with quite some residual sugar left after fermentation. It has moderate alcohol, high acidity and medium tannin, which makes the wine taste silky, smooth and lean. The overall balance is fair, with a round body that makes you realize that this is a friendly, a bit opulent and a bit oily riesling wine. The wine has a medium finish with a balanced, a bit bitter, but quite elegant, aftertaste – like a summer nectar juice, but less sweet and a bit more refreshing. This is definitely a fine Wine of Moldova and the overall rating says the same, with 89.4 points scored it is right there, among the best wines we’ve tasted so far. Please click on the chart icon on the left in order to get to the wine rating page, where you can find all the wines we’ve tasted to date. 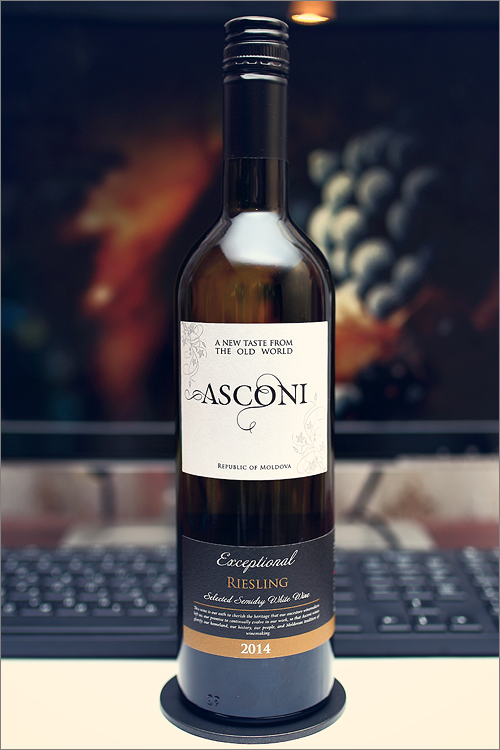 Last but not least, it is to be mentioned that Asconi Winery is already quite well renown for it’s white wines, some of them highly appreciated at international wine tasting competitions. All in all, we’ve been quite impressed by this wine – friendly, smooth and round, a wine that can be easily described as a crowd pleaser. After all, how many times can you get the chance to taste a riesling wine with nuanced rubber-petroleum notes – a quality that is most common for Grand Cru d’Alsace riesling wines. One more thing to add: next time someone takes a photo of you, just say ‘riesling’ and bring out the smile on your face.